With the VIEWPixx/EEG, MES Forschungssysteme is bringing VPixx Technologies’ premium monitor solution to your research lab to elegantly complement your Brain Products EEG system in the context of visual presentation. 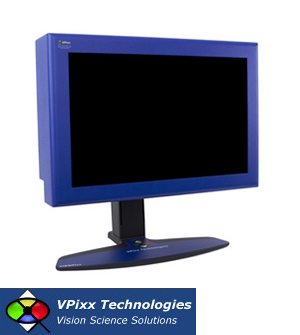 For a good while, VPixx Technologies has been offering the VIEWPixx, a state-of-the-art LCD screen designed for visual science research. Although the exclusive features of the screen are outstanding, not all of them may be necessary for the vast majority of EEG researchers. In response to increased requests for a more essential monitor solution, VPixx has developed the VIEWPixx/EEG, offering all necessary functions at an attractive price-performance ratio. The VIEWPixx/EEG is an affordable premium display designed to meet the needs of researchers in the fields of neurophysiology, cognition, and psychophysics. Optimized for triggering external data acquisition systems to precisely timed visual stimuli, the VIEWPixx /EEG features LCD glass with the fastest possible pixel response and a panel controller. A novel scanning LED backlight design prevents ghosting and flare effects. The VIEWPixx/EEG comes as plug and play monitor with an external power supply and includes 24 TTL output triggers for the synchronization of external data acquisition systems such as EEG and eye trackers with microsecond accuracy. Another great thing: The triggers can also be used to initiate external stimulators such as TMS. The levels of the 24 TTL outputs are controlled by the 8-bit RGB components of the display’s top-left pixel. You can easily program this strategy with any stimulus generation software. This guarantees perfect synchronization between video and external hardware. Would you like to receive more information on the VIEWPixx/EEG? Please do not hesitate to contact MES at office@mesmed.de and let us know how we can assist you with your query.